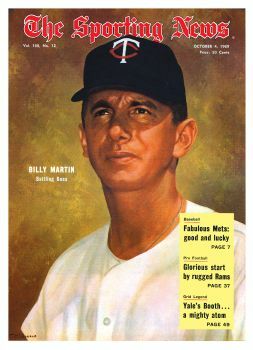 “Billy Martin was a great manager, whom I learned a lot of baseball from. His strategy and willingness to always push the envelope when it came to making the opposition try to stop us from taking extra bases, stopping us from stealing home, double stealing and taking the extra base almost all the time. Coming Monday: Contrasting memories of owner Calvin Griffith. The Sporting News is one of my favorite magazines of all-time. I’ve never seen this cover… but it’s awesome. I think Billy’s career can be summed up in two personalities. One the NYC bronx zoo icon the other the rehabilitor of sinking or sunk franchises who could engineer an 20+ win turn around from season to next. I like the latter guy. Lost in the history is the fact that Martin was a Twins franchise guy, groomed to take over managerial duties, all through the 60’s, scout, coach, AAA manager but they also had a very short leash on him.